This has been the story of my life. I am not and have never been excellent at anything. Above average at certain things maybe, but by no means outstanding. I work hard though. At school, at university, studying for a driver’s licence etc etc. Whether it is my blog, my job, or my relationships I always work hard at them. But I never tell anyone how hard I am working so sometimes I end up with more and more being piled on me, because I make what I do seem effortless. My parents actually used to put too much pressure on me to always be better. Neither of them went to university and my mother left school at 15 so they really wanted me to excel. I learned to read and write before I was five and I was intelligent. I was always in the top three at school. But if I got 80% in a test, they wanted 90%. If I got 90% they wanted 100%. I felt as though they were never happy with the best I could do. They did push me further than I thought I could go but I was always seeking their approval and no matter how hard I tried I never fully received it because they always said ‘you can do better’. I am not sure if they even realised how hard I was working. I think this happens with so many high-performing people. They just get on with it and work hard but because they just get the job done, no one realises how hard they are working, so more and more work is piled on them. 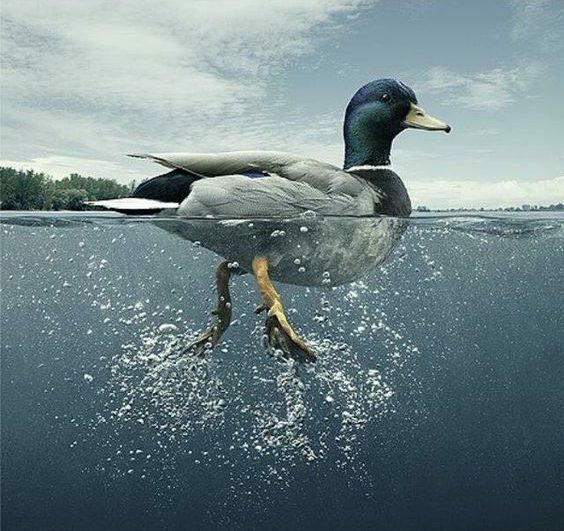 It’s like the duck above – people see you gliding peacefully and effortlessly around on the water but they don’t see your feet furiously flapping underneath to get you where you are supposed to be going. In the 2000s I was working full time as a teacher and director of courses at a language school. In a matter of months, one staff member went on parental leave (which is one year in Sweden), one staff member left, and one retired. I was given most of their teaching and some of their administrative duties. In addition I did all the social media for the company and I produced a text book. All this as well as my regular teaching and administrative load. I found it really tough going and I realised I was not coping. But part of me wanted to be the superwoman everyone thought I was (yes, I liked the praise), part of me hated saying no and another part of me did not want to show weakness. So I battled on. I worked when I was ill, I never complained, I worked long hours at home. By the time I told my employer I was not coping I was already quite ill. They were so used to me just getting on with it that they did not react and thought my struggles would pass. And I burned out. I was unable to work for almost a year and I virtually had to learn to read and write again. Since then I have tried to be better – the main thing is I have learned to say no. I have stopped subjecting myself to stress because I want people to think I am good at everything. I also now work as a freelancer meaning I have the freedom to take on whatever I want and say no to the rest. But I still see it all around me – people frantically paddling while being given more and more to do because all anyone sees is the duck on the water. I wish more managers saw the duck feet and not just the duck. At least some of us have learned (often the hard way) that our feet can’t go on that way forever. At least not just so that people can think we are superwoman or man.